Christmas decorations didn’t used to be so stressful and needn’t be today! Forget about fancy decorations because old school is the way to go for me this holiday. Find out how you too can use native plants for a fresh and traditional way to decorate for the holidays as you read on. Fancy store-bought decor stuff can make a pretty big dent in my budget. So now, I’m using garden plants for my Christmas decorations not only for their beauty but for their practicality too. The scent and aroma of native plants are just lovely around the home. And I can just throw the wilted or dried greens into the compost pile after. So join me as I explore once again our native plants and how to use them creatively for Christmas decorations. Christmas decoration ideas aren’t hard to come by, especially online. Although my imagination works pretty fine, it’s nice to get a helping hand. Check out for more Christmas decor ideas here and some of my few samples below. Pine cones may be simple but there’s just something rustic and cute about them, making them great for decorations. Adding some paint pretties them up some, but they do just as they are or with bits of pretty ribbons. Balance is important in design especially in decorating front door and porches. Create identical decor design on either side of a porch step or door for some curb appeal. Our good old wreath can never be outdated for holiday decorations. Whether it’s the 4th of July, Thanksgiving, and even Halloween, a wreath has to adorn a door or any part of the house. Garlands are one of the traditional Christmas decorations that date centuries back. So, how else are Christmas garlands best made than with organic and natural resources found around you? Make use of planters and containers stripped bare of plants in this cold winter season. Using native plants, arrange a Christmas container garden for an organic look. Which you won’t have to water every now and then, by the way. Whether you want your decorations simple or over the top, nothing beats natural decorations, especially for your front door. 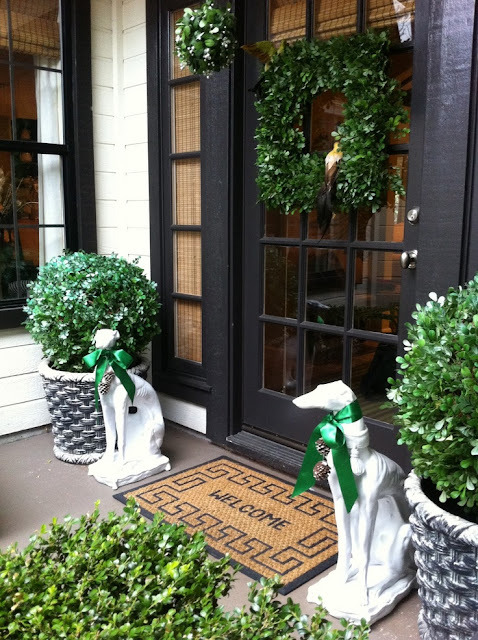 Take this boxwood wreath decor idea and a mistletoe to go! Make your holiday feast scrumptious with a lovely table setting. Nothing will make your table look more festive than native plants, such as trusty evergreen and red berries to accentuate. Native plants are practically accessible around you. Your very own garden may boost of plants great for decor purposes. Some native plants outside your garden may be more attractive but don’t take any without permission. Parks and public places are especially off limits. If you still can, plan ahead and plant what you’re hoping to use by Christmas. Native plants boost a variety of leaf forms, structure, and color. Use these factors to make organic and unique decorations. Evergreens can have broad green leaves while some have blue to silvery, needle-like leaves. Fir, Spruce, and Pines are some of the most common evergreens used for Christmas decorations. Other evergreens are Cypress, Juniper, Magnolia, and Boxwood. A variety of colors in Christmas decorations can be achieved. Although lesser plants make it throughout winter, some native plants give a better color display this season. The red twig dogwood, for example, is stripped of its leaves in winter, revealing attractive twigs which are fiery red in color. The ripened berries of native plants such as holly and firethorn give off a beautiful color display as well. To add attraction to your decorations, use other plant parts like seed pods, twigs, and berries. Seed pods from magnolia, lotus, acorns, and pine cones add drama to any decor arrangement. You will find the red twig dogwood interesting in Christmas containers just as Winterberry – twigs, berries, and all. When using native plants for your decorations, learn to improvise when some plant species are hard to come by in your area. Herbs such as rosemary, sage, and laurel can substitute for evergreen fir and pine. Holly can be substituted with boxwood and winterberries with nandina berries. As appealing as plants are as a holiday decoration, you must be aware plants are fire hazards when prepared improperly. Use plants with high moisture level or those which retain moisture longer like evergreens. You can also follow these tips for preparing native plants properly. Use pruning shears when cutting plants. Use only fresh plants and avoid placing them under the sun or other heat sources. Crush the base of woody stems to better absorb water and soak the fresh plant pieces in water overnight. Check your plant decor’s freshness and replace them once dried up. Use anti-transpirant for low moisture plants. Remember, most native plants you may use like ivy, mistletoe, yews, and hollies have poisonous berries. Make sure to keep them out of reach of curious children and pets. Pick up after fallen berries to avoid poisoning hazards. Watch out also for prickly plants like Firethorn and Holly, and prepare the plants with care. When using the discarded plant decor for compost, make sure no paint was used which can be toxic to microorganisms. There are some plants which you may like but got no access to for decor uses now. But you can always plan for next year. Knowing about native plants which are great for holiday decorations will allow you to make plans for planting in spring. With winter plants added, I can just imagine your garden with a year-round appeal. Whether for the main pieces or just to accentuate, native plants are perfect for holiday decorations. Pretty inexpensive and even free if you know your garden. Knowing your plants will totally save you a lot of trouble and money when decorating for the holidays! Did you find the topic useful for your own Holiday decoration plans? We would be delighted to know how you are getting about with yours. Tell us about it by posting in the comments section below.